My 1 Hour Instagram Strategy & Workflow - Brand Strategy Co.Brand Strategy Co. In celebration of my new free training (sign up below! 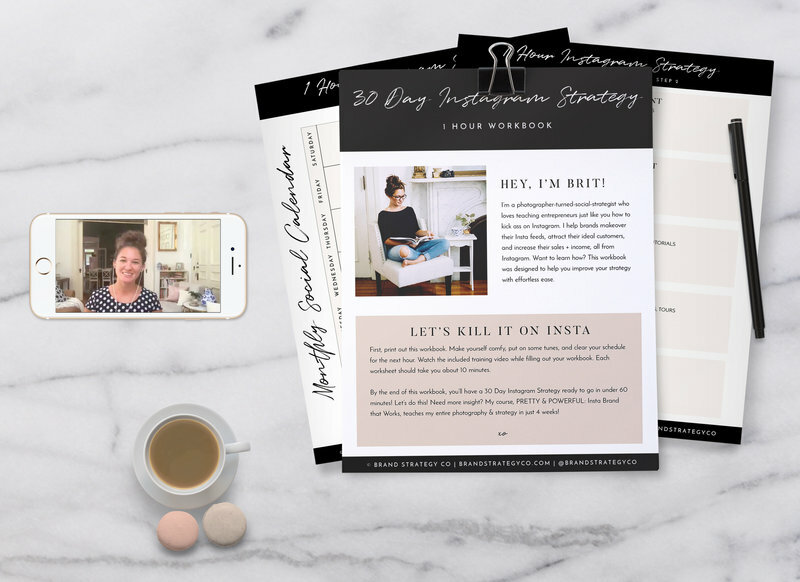 ), I wanted to share my full 1 Hour/Month Instagram Strategy & Workflow that I use for both my own business and my consulting clients. We use this workflow to plan 30 days of Instagram content. This blog post is an adaptation of my Instagram live (watch below, or keep reading). My 1 Hour Instagram Strategy & Workflow from Brit Chandler on Vimeo. Before we dive into the workflow, I like to start with the strategy side of things. I like to brainstorm things like your ideal target market and your objectives & goals for being on Instagram. After that, I dive into topic planning, AKA what content should you be talking about on Instagram? From there, we work those topics into a weekly topic calendar. Monthly Calendar: Write down all events, announcements, blog posts, launches etc. Anything big we know we need to mention on Instagram. After that, we look at our weekly content calendar and fill in the remaining days. Shot List: Once our calendar is complete, we need to make a list of photos we already have in our photo banks, photos we need to take, and if we need to buy props or create new products for our photos. Gather Content: Now it’s time to gather your images, write your captions, make your graphics, and take any photos you need for the month. Schedule Content: My recommendation is to schedule the important posts that you don’t want to forget, like your blog posts and announcements. Then leave blank spots for real time posts. Analytics: And at the end of each month, take a look into your Instagram insights and analytics. 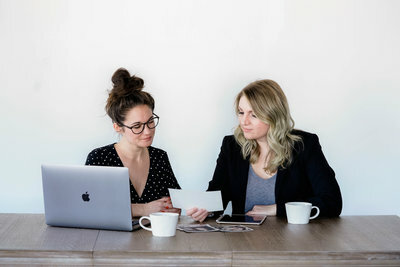 Jot down your audience demographics, the best times for you to post, and your top posts for engagement and website clicks. 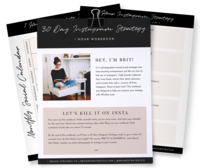 Do you want more strategy and insight for Instagram? Don’t miss my FREE TRAINING. It includes a 6 page printable workbook and a 12 minute mini training video. Sign up below.